If you’re considering adding a heritage-inspired item to your accessories, this Gucci bag is the way to go. One of the world’s leading fashion houses, Gucci started out in Florence, Italy, in 1921. 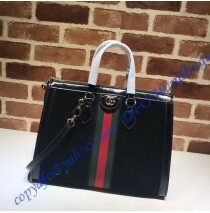 Today, Gucci is known for creative designs, innovative trends, and Italian workmanship. Some would think such an old brand would fall behind and become outdated, but that’s not the case here. As years go by, Gucci keeps showing us why they are one of the largest brands in the world. When this brand felt that there was room for modernization, they changed their creative direction, while remaining true to Gucci’s roots. Under the helm of Alessandro Michele, Gucci altered and adapted to the 21st century. You can still recognize Gucci’s heritage tailoring, but now in combination with new brand codes and eye-catching motifs. All of this is embodied in the Ophidia top handle bag you see here. The Ophidia line becomes complete with this tonal-brown bag covered in brand’s house codes. 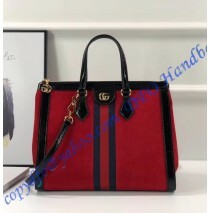 It is crafted in Gucci’s Supreme canvas that bears the brands recognizable red and green web stripe. The Supreme canvas is eco-friendly, as it is Gucci’s signature material with low environmental impact. 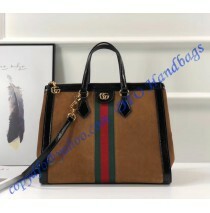 If you always liked retro, you will fall in love with this square-shaped top handle bag. 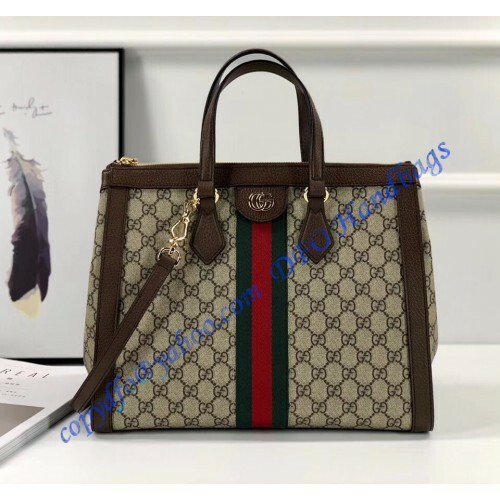 As you can see, this bag has a brown leather trim that gives it a unique outline that will make you stand out wherever you wear it. Simple to combine, and versatile to carry, this bag has handles, as well as a detachable shoulder strap. You can carry it in one hand, over the shoulder, or cross-body — depending on the occasion. The interior of the bag is simple — two smartphone pockets and a zipper pocket allow you to organize your knickknacks without limiting the bag’s large inner space. When it comes to size, this bag falls under the medium category. Its width is 13”, height is 10.8”, and it is 5.7” deep.